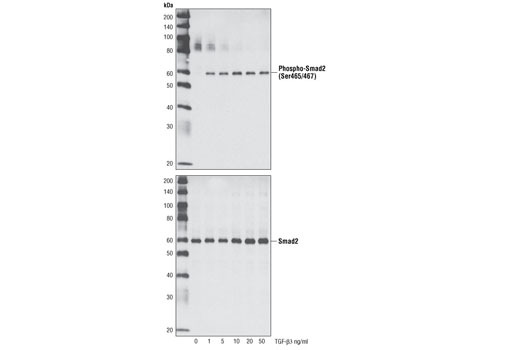 Western blot analysis of extracts from serum-starved HeLa cells treated for 30 minutes with various concentrations of Human TGF-β3 using Phospho-Smad2 (Ser465/467) (138D4) Rabbit mAb #3108 (upper) and Smad2 (86F7) Rabbit mAb #3122 (lower). Recombinant human TGF-β3 expressed in E. coli and is supplied in a lyophilized form. A greater than 95% purity was determined by reverse-phase HPLC and SDS-PAGE. Specific activity was determined to be less than 0.05 ng/ml. The working concentration of TGF-β3 generally ranges from 10-50 ng/ml. Lyophilized product is very stable at -20°C. It is recommended to reconstitute with sterile water at a concentration of 0.1 mg/ml, which can be further diluted in aqueous solutions as needed. Addition of a carrier protein (0.1% HSA or BSA) is recommended for long-term storage. Transforming growth factor-β (TGF-β) superfamily members are critical regulators of cell proliferation and differentiation, developmental patterning and morphogenesis, and disease pathogenesis (1-4). TGF-β elicits signaling through three cell surface receptors: type I (RI), type II (RII), and type III (RIII). Type I and type II receptors are serine/threonine kinases that form a heteromeric complex. In response to ligand binding, the type II receptors form a stable complex with the type I receptors allowing phosphorylation and activation of type I receptor kinases (5). The type III receptor, also known as betaglycan, is a transmembrane proteoglycan with a large extracellular domain that binds TGF-β with high affinity but lacks a cytoplasmic signaling domain (6,7). Expression of the type III receptor can regulate TGF-β signaling through presentation of the ligand to the signaling complex. The only known direct TGF-β signaling effectors are the Smad family proteins, which transduce signals from the cell surface directly to the nucleus to regulate target gene transcription (8,9). Three isoforms of TGF-β, designated TGF-β1, TGF-β2 and TGF-β3, are encoded by distinct genes and are expressed in a tissue specific manner (10). Each isoform is synthesized as a larger precursor protein containing a propeptide region that is removed prior to secretion. Mature TGF-β contains two polypeptides linked by disulfide bonds to form a protein of approximately 25 kDa. Massague, J. et al. (2000) Cell 103, 295-309. Caestecker, M.P. et al. (2000) J. Natl. Cancer Inst. 92, 1388-1402. Derynck, R. et al. (2001) Nature Genet. 29, 117-129. Miyazono, K. et al. (2000) Adv. Immunol. 75, 115-157. Derynck, R. et al. (1997) Biochim. Biophys. Acta. 1333, F105-150. López-Casillas, F. et al. (1991) Cell 67, 785-795. Wang, X.F. et al. (1991) Cell 67, 797-805. Massague, J. et al. (2000) Nat. Rev. Mol. Cell Biol. 1, 169-178. Kingsley, D.M. (1994) Genes Dev 8, 133-46.